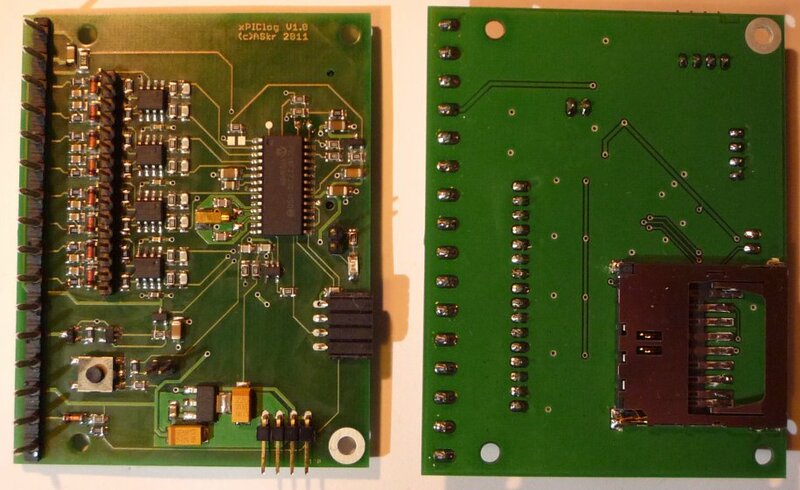 xPIClog, a simple, but quite versatile and configurable, long-time 8 channel SD-card data logger. Powered by a PIC18 and SourceBoost. First published application: 9V battery test (GERMAN ONLY!). The complete design was developed with a pure lab device in mind, aka. : "engineer's little helper". Measuring voltages exceeding 3.3V requires external components (e.g. simple resistor dividers, etc...), but this offers much more flexibility than fixed dividers, which, e.g., would reduce the input impedance or limit the resolution. As simple as it can be, a single MCP1703-33 and a handful of tantalum and ceramic caps, powered by 4 AAA NiMH or alkaline cells. The MCP1703 has a quiescent current of ~1.5uA (@5V,25°C). Only few other regulators (e.g. Seiko S817 can operate at lower currents, but are harder to find and cost a lot more (single component). The internal real-time clock is operated by timer1 oscillator in conjunction with an external 32768Hz quartz (MS1V-7 (*1*)). While operating (sampling) or turned off, the PIC is kept in sleep mode, with RTC enabled. Once powered up (sampling or serial menu operation), the PIC is powered by its internal RC oscillator, boosted to 32MHz via the 4xPLL. 32MHz operation is a compromise between current consumption, computing and SD-card speed and raises the current consumption up to ~10mA. I did not yet bother about adding a third clock (e.g. 4MHz) for operations that do not require SD-card access. This might get built in, in a future version. For in-circuit programming, three test points MCLR (VPP), PGC and PGD are available. Necessary GND and +3V3 connections are available at terminal X8-1/X6-2/X1-1 (GND) and X7-1 (+3V3). (*1*) Note that the schematic contains a MS1V-10 (10p-type). This probably requires C12 and C14 to be raised up to 12pF. To avoid any excess currents in the digital CMOS PIC input stages, R5 "quickly" (T=20ms) discharges C4 and pulls VCC to GND. Note that the PIC programming pins PGD and PGC share the SD-card's chip select and clock line. The card has to be removed during programming. The eight analog inputs first hit a low-pass filter (e.g. : R7, C5; fc=80Hz) and are then directly fed to the MCP6032 gain stages, which can either operate as pure impedance converters (V=1, jumper open) or amplify by a factor of 10 (jumper closed). Note that the inputs are left floating. The absence of any pull resistors maintain a maximum of flexibility for external connections and offer the highest input impedance possible. The complete gain stage can be powered down via T2, saving additional ~8uA (1uA per amplifier). By default, the circuit is only protected against reverse polarity (e.g. : D2)! every MCP6032 output and the PIC's internal clamp diodes. If protection against overvoltages is required, the diodes, right in front of the non-inverting inputs, can be replaced by Z-diodes (~3V6-4V7), but this requires a careful selection. Otherwise, precision might suffer from nonlinearities for high-impedance inputs. At the same time the MCP6032s are turned on, the internal +3V3 supply is activated at terminal X1-2, and the open drain pin X6-1 is pulled to GND. This can be used to turn on (or off) external components or circuits that otherwise would draw too much current. Notice that external equipment should not draw more than 10-30mA. R30 adds a little safety and protects xPIClog against short circuits, but of course creates an additional voltage drop, hence the output voltage will decrease with rising current demand. To maintain precision, the terminal voltage can be monitored via AN4. No tricks, no saftey, just a plain CMOS level serial interface at X10, operating at 115200bits/s, 8N1. X10 has a MiniFTDI compatible pinout. The firmware was developed with SourceBoost, my favourite PIC C-Compiler. It includes my slightly modified version of ChaN's great FatFS. I used a Pro license, but as far as I know, the Full-license comes with the same, unlimited memory access. Make sure SourceBoost does not include any of the standard versions from its own LIB directory! This won't work! On first power-up (battery was disconnected), the circuit powers up in "menu-mode", ready to receive commands via the serial interface (115200bits/s, 8N1). First thing you should do is, setting the RTC to the current time and date (see command list in next chapter). If the SD-card contains a file named "POWERON.CFG" in the root directory, it is read and executed. All config files can use the same commands as the serial interface, although not all of them will be executed (e.g. : "OFF", "START", "LOAD"...). After setting the RTC, xPIClog is ready to start data acquisition.